Before Bryn Ballenger lost all her savings, she began to lose her eyesight. It was February of last year. A black spot appeared in her vision, and then that spot started to spread. "It was like a hole in a sweater getting bigger and bigger and started unraveling," says Ballenger. Her retina, she later learned, had come unattached. The first surgery, she recalls, had a $12,000 price tag. But then there were four more. And Ballenger's bad luck wasn't just medical — it was geographic. Ballenger lives in Sandpoint, Idaho. If she lived in Newport, Washington, or Bend, Oregon, or Missoula, Montana, she would qualify for Medicaid. They all chose to take the federal government's offer and expand Medicaid. Idaho wouldn't. She still would have lost much of her vision, but she wouldn't be $30,000 in debt. She wouldn't have had to consider filing for medical bankruptcy. She wouldn't have had to face hospitals denying her from surgery because she didn't have insurance. She wouldn't have had to spend six months pleading with providers to cut her a break on medical bills. She might not be on her third appeal to apply for disability. "I've been working since I was 16. Doing everything right," says Ballenger, 42. "Saved money. Now it's all gone." Ballenger is one of the 62,000 Idaho residents in the "Medicaid gap," a surreal situation the authors of Obamacare never intended to exist: She makes too much money to qualify for Idaho's comparatively meager Medicaid program, but not enough to qualify for any of Obamacare's federal subsidies. And when she spoke with Idaho Health and Welfare about her plight, she says their advice was stark. "Their suggestions were to crowd-fund or to move to Washington [state]," Ballenger says. But now, there's another possibility. For the last year and a half, Ballenger has been telling her story as part of an effort to convince Idaho voters to expand Medicaid. Now, what seemed like a longshot in a state that hates Obamacare actually looks like it has a chance. "It's on the freakin' ballot," Ballenger says about Idaho's Proposition 2. "It's amazing." Ballenger says she even pleaded the case directly with Idaho Gov. Butch Otter when he visited Sandpoint last fall. "'Why can Washington and Oregon expand and we can't?'" Ballenger recalls asking Otter. "And we know the answer to that. It's all freakin' politics." Obamacare is a dirty word in Idaho. It's a state where Hillary Clinton got less than one-third of the vote. It's a state where a handful of legislators and activists, time and again, have attempted to address the health insurance gap, even in modest ways, only to watch their efforts collapse every time. In part, that's because of opposition by influential groups like the libertarian Idaho Freedom Foundation. "We actually believe that Medicaid expansion threatens Idaho's future," says Fred Birnbaum, the foundation's vice president. "We see it as a big threat." When a January 2015 poll from the Freedom Foundation stressed that the Medicaid expansion was associated with Obamacare and involved "working-age, nondisabled, mostly childless adults," only 39 percent supported the expansion. But when you just ask Idaho voters if they want to expand Medicaid or increase health insurance coverage? The polls have consistently shown significant margins of Idahoans are supportive of it, once removed from the toxic "Obamacare" context. Crucially, the text of the Idaho initiative doesn't mention the word "Obamacare" once. Luke Mayville, the Sandpoint High School grad who helped lead the charge to get the initiative on the ballot, argues that Idaho voters have seen the impact of the Medicaid gap firsthand. "When you just go around and knock on doors and talk to people, most people know someone who falls in that gap," Mayville says. "They have a lot of compassion." He says he thinks we're going to be surprised by the level of support you'll see from rural communities, where, in some places, the uninsured rate can be 25 percent. "We're talking about the working poor, by and large, people who are entrepreneurs trying to hold down a couple jobs." But lately, Proposition 2 supporters have also been pushing a more classic Idaho conservative argument: You're paying taxes and not seeing the benefits. For years, the federal government has been paying almost all the cost of the states that expanded Medicaid. Even going forward, the feds will pay for 90 percent of the cost of the expansion, with states paying for the final 10 percent. In other words, Mayville argues, Idahoans are paying taxes to the federal government to pay for expanded Medicaid in Washington and Montana and California, but Idaho isn't getting any of it. "It's very hard to sell to the people of Idaho that they should be the ones who foot the bill without getting the benefits," Mayville says. That's the theme of the first Idahoans for Healthcare television ad. "Your tax dollars to pay for their health care," the ad's narrator says, as cartoon dollar bills spin inside a green silhouette of that most Idaho-reviled of all states, California. "But there's an Idaho solution to change that: Proposition 2." The Freedom Foundation responded to the argument that expanding Medicaid would bring "our tax dollars back to Idaho" with calls for TV stations to pull the ad for making inaccurate claims. It's not like there's just a pool of taxpayer money dedicated to Medicaid that California gets if Idaho doesn't, Birnbaum says. He notes that, as a state with a lot of federal lands, Idaho is already taking more tax revenue than it sends to D.C.
And since the federal government is running a deficit, the Freedom Foundation argues, it isn't other states that would pay it — it's "our children and grandchildren will bear the burden of a larger national debt." But maybe the central argument of the initiative's opponents is outlined in the name of the PAC leading the opposition: "Work, Not Obamacare." It discourages work, Birnbaum says. After all, if you start making too much money, suddenly you lose access to Medicaid. "With an economy that we have, there are more jobs opening with unemployed people, it would behoove all of us to encourage people to work," he says. But even some Republicans, like outgoing state Sen. Luke Malek, object to the premise of that argument. "We're talking about the working poor," Malek says, "by and large, people who are entrepreneurs trying to hold down a couple jobs." A study of the Medicaid expansion in Ohio found that about half of Ohio Medicaid expansion enrollees work. In fact, 84 percent of employed expansion enrollees said that the expansion made it easier to work, while 60 percent of those still underemployed said the expansion made it easier to work. In a state filled with Republicans, expansion proponents have needed to win the support of relatively moderate Republicans like Malek. 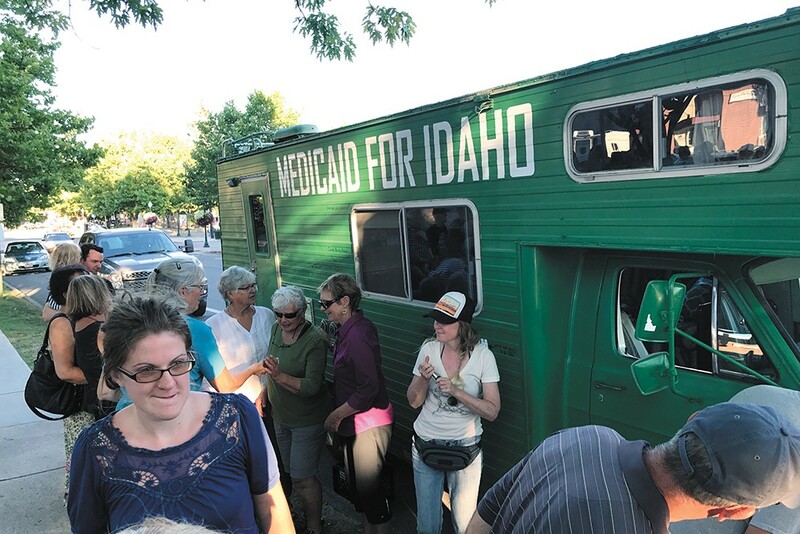 "I don't think that expanding Medicaid under the Affordable Care Act is the solution that Idaho needs," Malek told the Inlander back in January. But that was back during his unsuccessful run for Rep. Raul Labrador's soon-to-be vacant congressional seat. Since then, freed from the shackles of campaigning, Malek has publicly endorsed the expansion efforts. "The Legislature needs to take the federal funding to create more comprehensive solutions. I'm all for getting the cash into the state," Malek says. "My hope would be that if this passes, this is the people in Idaho telling the Legislature, 'Help us fix the problem.'" Simply expanding Medicaid won't solve everything, he says, but it would give the Legislature a crucial funding stream to enact much-needed reforms. Another retiring North Idaho senator tarred by the Freedom Foundation as too moderate, state Sen. Shawn Keough of Sandpoint, also endorsed the initiative. Even Birnbaum acknowledges the flaws and absurdity of the Medicaid gap. It's just that he has a list of more conservative proposals to deal with it, including giving states more control with how to spend Medicaid money, or giving insurers more flexibility by getting rid of the "essential benefits" requirement that they cover things like mental health, outpatient care, maternity and newborn care. It's easy for such policy debates to quickly lapse into the theoretical. But for those still living in the gap, like Ballenger, the stakes remain achingly tangible. They're called "historic horse racing" machines, but they act a lot more like slot machines. Idaho's Proposition 1 comes down to a basic question: Should Idaho legalize a very specific type of video gambling exclusively on tracks that feature or broadcast horse racing, in order to help horse racing survive? Originally, "historic horse racing" machines were sold to the Legislature in 2013 as something that would allow players to bet on historic horse races, mostly like they bet on live racing. The machines, it turned out, looked almost identical to slot machines. 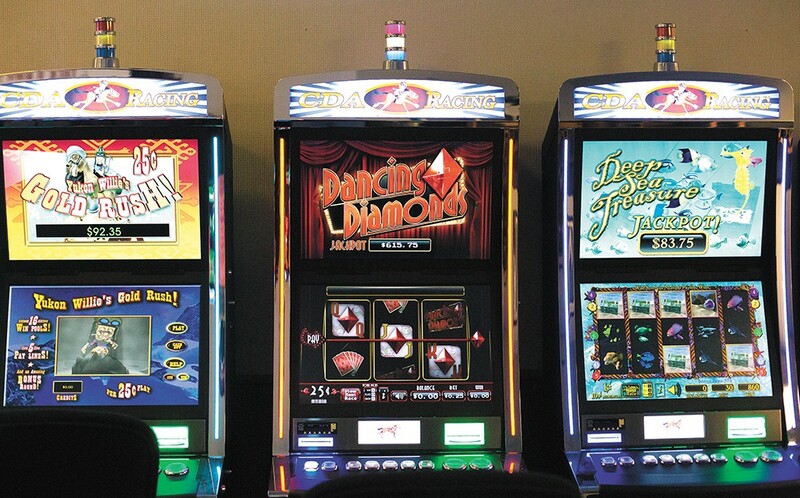 While the outcomes are, theoretically, tied to specific historical horse races, the horse races are generally exiled to a few-second video clip on a tiny screen below whirring slots and bonus games. Legislators, feeling duped, banned the machines again in 2015. But it's also fair to say that the horse racing industry has been struggling to turn a profit for a long time. The machines were a cash cow that seemed like they were going to save the race tracks. When they went away, one track, Les Bois Park in Boise, shuttered its doors. The initiative's biggest supporters — a group that includes Idaho Gov. Butch Otter and U.S. House candidate Russ Fulcher — argue that without these machines, Idaho horse racing is effectively dead. Not only that, but some of the money generated would go to local Idaho schools. Emphasis on some: Only half of 1 percent of the machine's revenues will go in the public school funds. By contrast, 90 percent would go back to the people who played the game, 9 nine percent would go to the machine's license holders. The remaining half percent goes to race tracks, horse breeders, the state racing commission and the Idaho Horse Council Youth programs account. And even if it does pass, it's sure to face a legal challenge. There's considerable legal doubt about whether Idaho's constitution even allows for the machines, even if voters give them the OK. The original print version of this article was headlined "Expansion Pack"